Egremont Russet is a medium-sized apple. The flesh seems quite dry and gets drier with keeping - it is moist rather than juicy. Traditionally described as "nutty", the flavor is more delicate than most varieties, and quite sweet. Both the flavor and the soft flesh are reminiscent of a firm pear. Yet Egremont Russet is surprisingly versatile, working well in savoury salads for example, and a popular partner for cheese. Like many russets, Egremont Russet is a good apple for sweet cider. The apples are not particularly juicy, so you need plenty of them, but the resulting cider is rich, thick, and very sweet. Fill in the details below and we will let you know when Egremont Russet apple trees are back in stock. 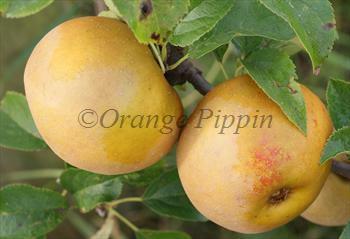 Egremont Russet is easy to grow, with generally good disease resistance, and a reliable though not heavy cropper. It can be grown in most of the cooler zones of the USA. For an English apple variety it is unusually cold-hardy and on a suitable rootstock can be grown in zones 4 and perhaps zone 3. A versatile English 17th century russet apple, Ashmead's Kernel is noted for its distinctive pear-like flavor.